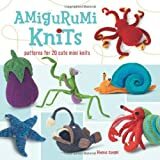 Amigurumi (pronounced ah-mee-goo-roo-mi) is the Japanese art of knitting and crochet small stuffed toys and figures. They are often adorable anthropomorphic animals or humorous caricatures of inanimate objects. While the pieces are often small and don't require a lot of yarn, knitting amigurumi can be challenging. In this free pattern directory, we have attempted to note the relative complexity of each pattern from beginner to advanced knitter. Intermediate. A knit version of the acrylonitrile molecule, as used in the production of acrylic fibres, represented as a ball and stick model. Beginner/Intermediate. Bob’s shape was inspired by the plastic thing that floats in your toilet tank. He’s not an elephant, or an anteater. Intermediate. This would be best knit in purple and green. Intermediate. These cuties are so fast to knit, a flock of them will be hopping off your needles in no time!